I just scrubbed a bunch of them off my car. It wasn’t easy. But they are fascinating. 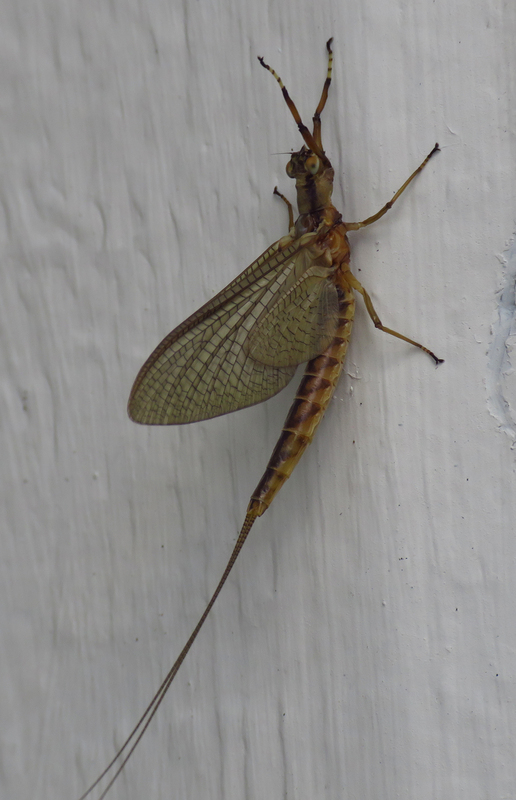 The adults of many mayfly species don’t even have mouths and digestive systems, because they don’t live long enough to need them. Mayflies fly in swarms, and mate in flight. … After mating and laying eggs, mayfly adults die and fall back into the water, becoming food for fish, frogs, and other aquatic life. Source. Mayflies do not attack people and will not sting or bite. The sheer numbers of these insects during their mating season can cause problems for drivers and annoy homeowners whose houses are coated in bugs. Source. I saw a few of them on the side of my house, so I took pictures (because that’s what I do!). Here’s the original. I used the Raynox 250 macro lens with the Canon camera and no flash, because I didn’t have the defuser with me. While visiting R, I took pics of some of his flowers. 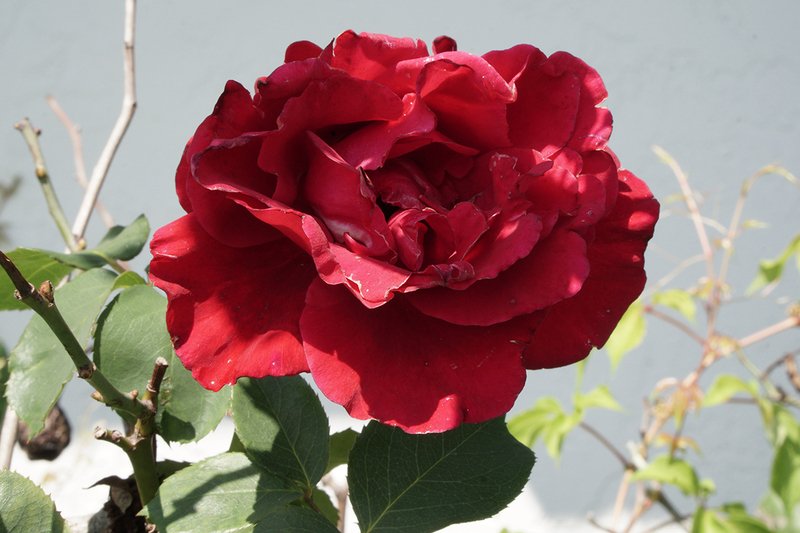 The rose was of particular interest. They’re beautiful, but what to do with them? On my way back to the car, I visited the boat ramp area. Someone said they’d spotted a young ‘gator there. The tip was good! He was really close to the place where people enter the water. I had two cameras with me, the Canon and the Sony. Each one is used for specific things, and I wanted to make sure I got good photos. All pics are clickable for uploaded size. 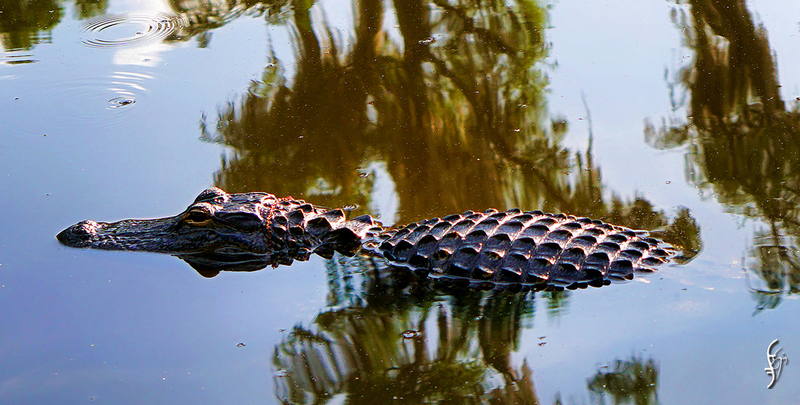 This ‘gator was about seven feet long, which means it was between three and four years old. At some point, a piece of red plant somehow got wrapped around its neck. Festive! 🙂 These two pics taken with the Canon. Kinda dark, right? And this was after processing! The Canon is not a DSLR. It has a superzoom I like for long-distance wildlife photography. Here, I was trying to get a closeup shot, because I only had the Sony 50mm with me for the Sony. Prime lens, no zoom. These were taken with the Sony, using the 50mm lens, which sometimes had trouble focusing because of the tree reflections. I urge you to click on these to see them larger. Notice the difference? 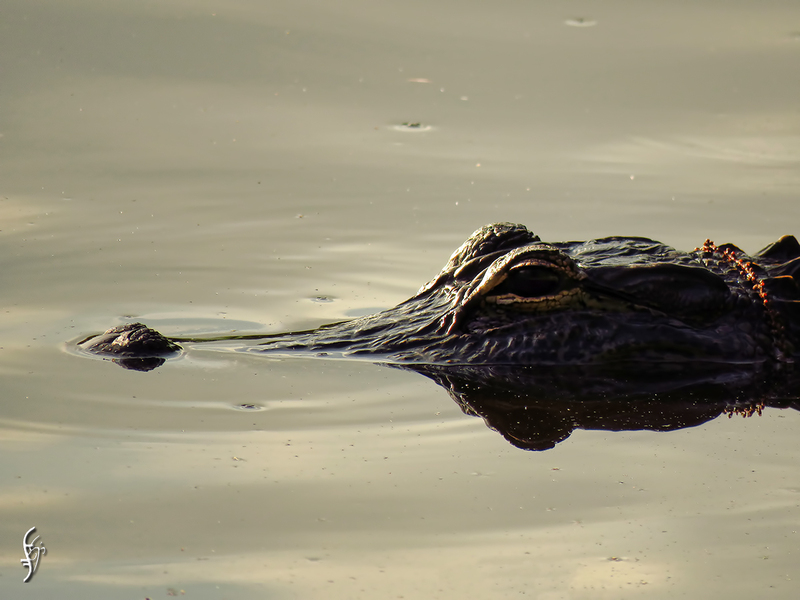 Yes, shot from a slightly different angle (I’d moved down along the boardwalk so I could get the whole ‘gator in frame), but the prime lens lets in a LOT of light. The result is a much brighter, more defined photo. And yes, prime lenses are sharper. I’ve taken enough pictures now to say that with certainty. Here’s just the front part of it. On the way home, I spotted a bird nest atop a platform. I pulled over, parked, and took pics. 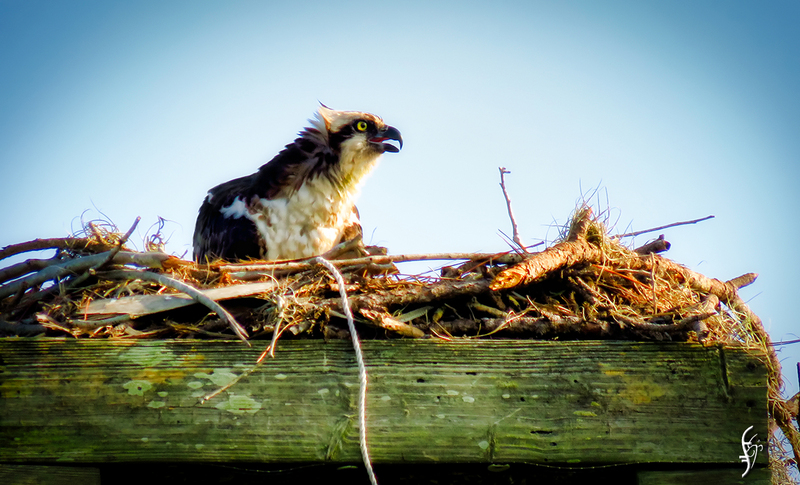 It was an osprey, looking somewhat worse for wear. The kids must have been driving it nuts. 🙂 Canon superzoom again. Not as sharp, and I had to brighten it in post. But I got the shot, and that’s what matters! I was too far away for the 50mm to be effective. 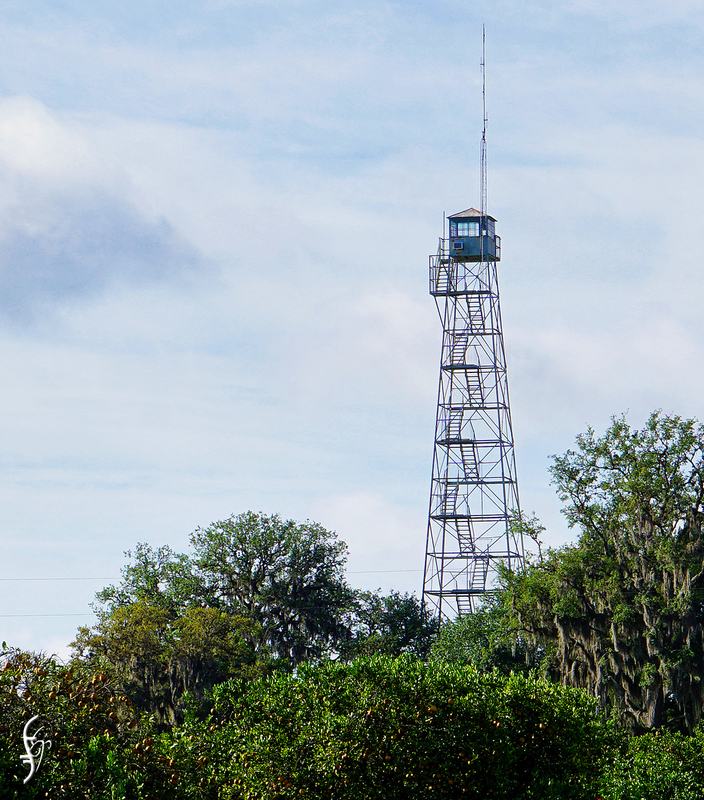 On Cty Road 17, I saw this fire tower at the Dept. of Agriculture outpost. Imagine climbing all those stairs! Sheesh. I don’t see a bathroom up there. Think they piss over the side? 🙂 Sony 50mm lens. 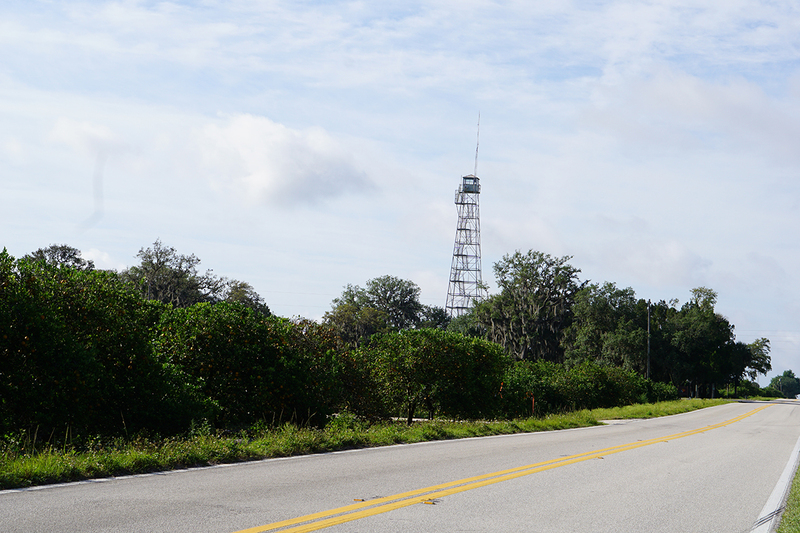 Even at a huge distance, handheld out the car window, everything is nice and sharp with little to no color fringing. Here’s the original, straight out of the camera. Hadn’t even straightened it yet. This gives you an idea of how far away I was! If I had to recommend a camera, I’d tell you to go with a Sony mirrorless. It comes with a kit lens that offers a small zoom. I bought a package and also got the 55-210 zoom lens, which works well. I’ve had good results with it. Then I picked up three prime lenses, because they really are outstanding. I never thought I’d get into a DSLR, given the expense involved, but I’ve taken some of my best pics with prime glass. I’m glad I took the plunge! I plan to return to the park soon. There’s more to see there, I’m sure. And there’s a place called the Gator Shack where I would love to grab lunch. The park is on the north side of the lake, and it’s a pleasant place to visit. Plus it’s free! It offers largemouth bass, black crappie, sunfish, and bluegill, and it’s a popular place to fish, as you can imagine. I was there early one morning, about an hour after sunrise, and there were only two other people in the park. By the time I left an hour or so later, plenty more had shown up. It was an overcast morning, with a 20 percent chance of rain. I took a chance, and it paid off. 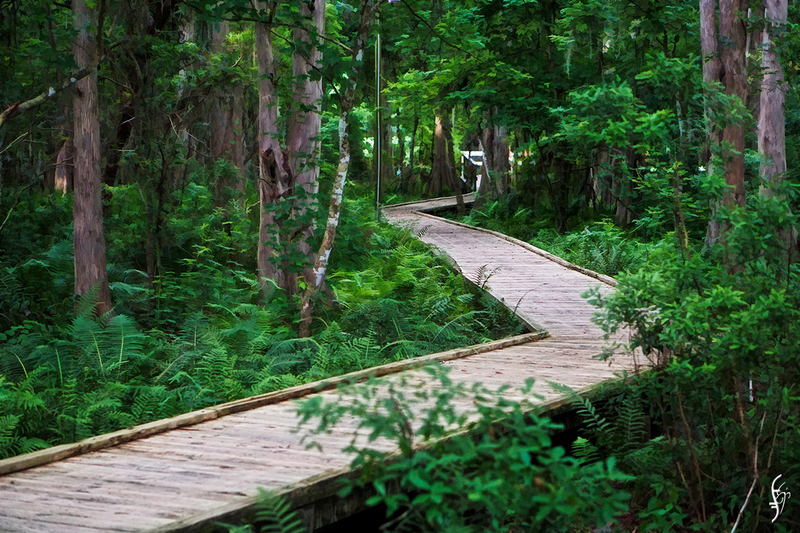 I hit the boardwalk, which leads off into a typical Florida forest, dark and dense. All pics are clickable for uploaded size. I finished a job and was itching to go somewhere new. I perused Google maps, found someplace interesting, and took off. I drove to Lake Istokpoga. I have no idea how to say it, but it’s huge. From Wiki: Lake Istokpoga is a 26,762.9-acre freshwater lake in Highlands County, Florida. It is fed by two creeks, Arbuckle Creek and Josephine Creek. The oblong-shaped lake is approximately 5 miles wide by 10 miles long. 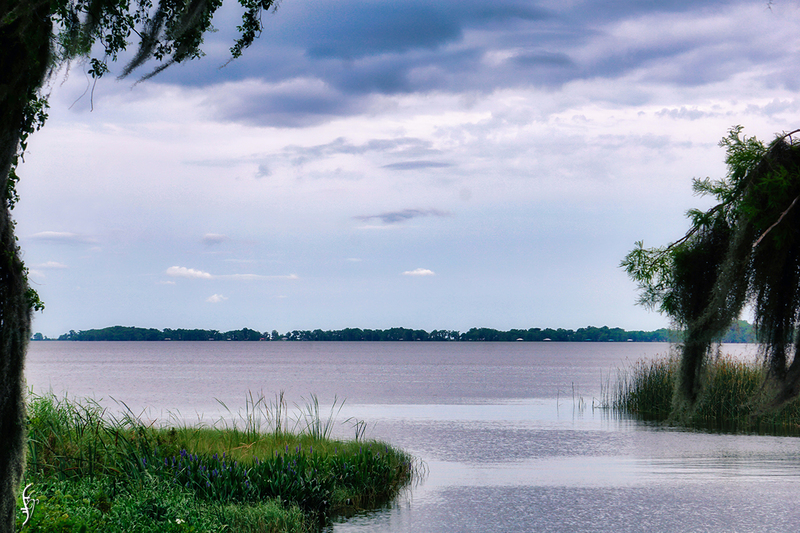 It is considered the fifth largest lake in the state of Florida. It was an overcast day. There was a lot of wind. Not a great day to be out with the camera, but I was glad to be there. This was the view from the parking lot.